I know you have a string of links on the Lets Run website covering information and stories on Ryan Shay's life, death, and memorials. My husband Chris and I wanted to share with you the event we held in memory of Ryan. Though we did not know Ryan well, I am a Stanford Track and Field alum and knew Alicia quite well. As you know, after Ryan's death, many of her teammates and others held memorial runs in Ryan's memory. 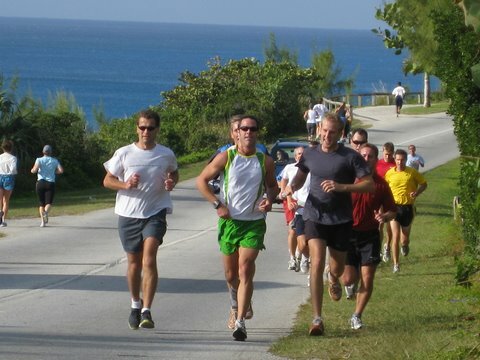 Chris and I decided to hold a similar event here in Bermuda. 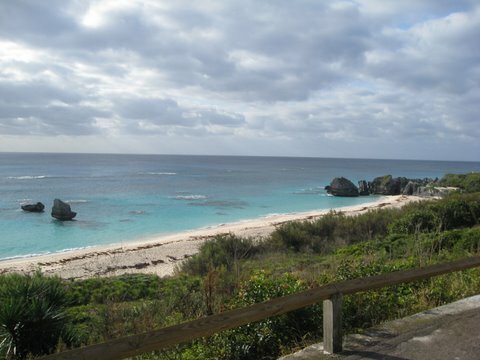 I am a native of Bermuda and have just recently moved back with my husband, Chris Estwanik. We got the word out through friends and connections in running circles. We even made it into a few newsletters and the local newspaper. 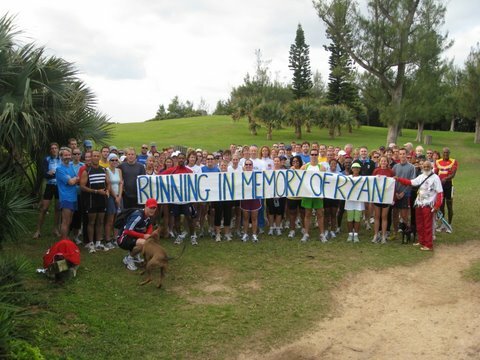 As the day approached, we hoped for a handful of people to turn up to run with us in memory of Ryan. The morning of the run, we rolled out of bed, made our coffee, and gathered the materials we had prepared. I had written a short speech, painted a banner, and made cards for all in attendance to sign. Chris had chosen a select passage from John Parker's "Once a Runner" that he thought represented Ryan well. We were getting into the car about 15 minutes before the event was to start when my cell phone began ringing. I picked it up to hear my mother on the other end frantically asking where on earth I was. "Mum," I said, "we're on our way. It doesn't start 'til 9, you know." "Well, there are tons of people here!" she screamed into the phone. I "ya, ya-ed" her a bit and hung up. Chris and I had a good chuckle on the way there about how she can get worked up and that there were probably ten eager beavers waiting to go on a Sunday run. A couple of minutes later we pulled into the normally deserted parking lot and grabbed a spot at the very back. It truly was full. When I saw the number of people waiting to run for Ryan and show their support, I was shocked and touched. 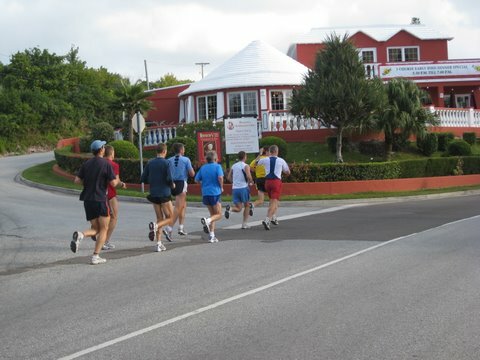 There were more people out for this memorial run than come out for just about any road race in Bermuda where there are actually prizes! The run was a great success. Someone did a count along the way and concluded that there were 116 runners, 4 babies, and 3 dogs. Countless people expressed their sympathies and wanted to send their condolences. They wondered what they could do, and hoped the run showed that even on a small rock in the middle of the Atlantic Ocean we can come together and demonstrate our support. We all hope that Alicia and Ryan's family can take a small bit of comfort and strength from us and the people of Bermuda. I have attached two pictures of a group of runners, the shorline where we did the run, and a gathering before the run with the banner. We will be sending a card to Alicia and to Ryan's family with signatures from all the runners and the banner picture on front. If you feel it is appropriate, we would love for you to post our story and pictures on your website.